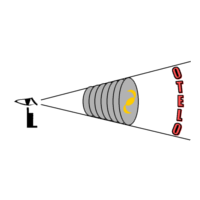 OTELO (OSIRIS Tunable Emission Line Object survey) is a deep emission line survey which takes advantage of Tunable Filter (TF) facility of the intrument OSIRIS on GTC, an unique facility in 8-10m class telescopes. TF have been chosen in a selected atmospheric window (around 8950-9300 Å) relatively free of sky emission lines . The survey produces 3D data cubes (proyected position + wavelength) from which a pseudo spectrum can be extracted. The pseudo spectrum is obtained from, tipically, 36 TF images (effective filter width of 12 A) at wavelengths covering a redshift dependent range of 180/(1+z) Å (that is a spectral resolution around 700). 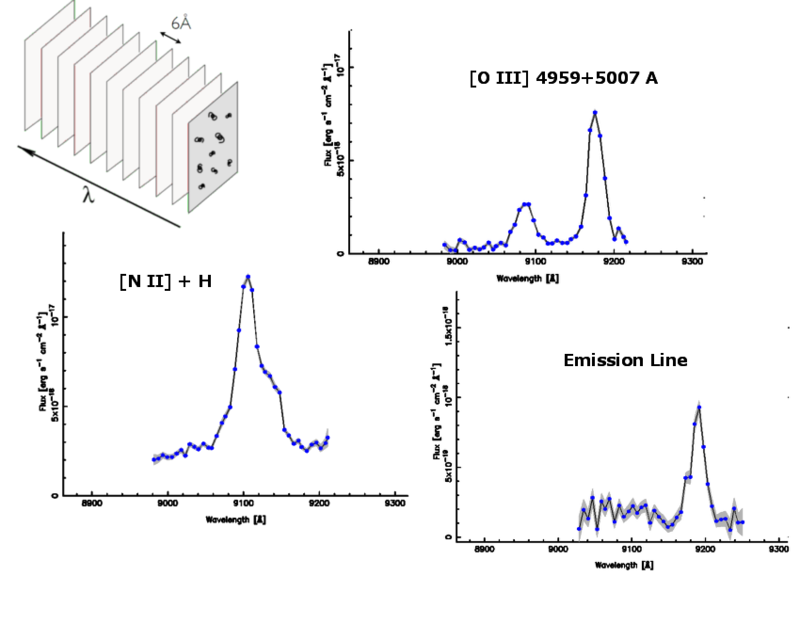 Thanks to the use of ancillary data to estimate the redshift of the source, it is possible to identify the observed emission lines, (including the deblending of Hα from the [NII]λ658.3,654.8 nm lines at redshift z ∼ 0.4), allowing to determine the nature and physical properties of the different sources. The survey studies a defined volume of the Universe with a 5σ depth of 1x10-18 erg.cm-2.s-1, which makes OTELO one of the deepest emission line survey to date. 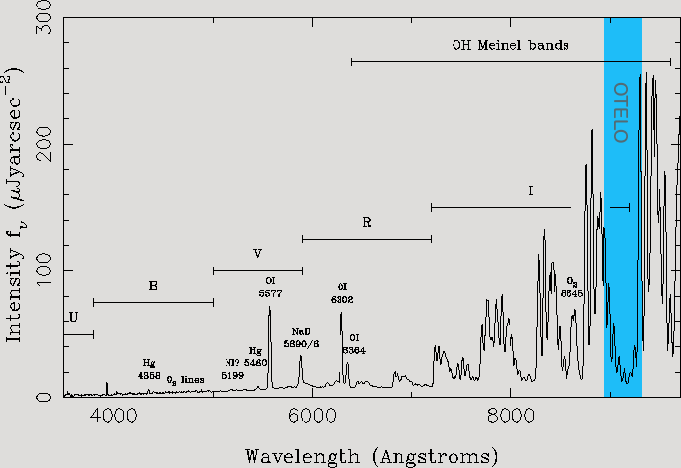 The figure shows some examples of OTELO emission line pseudo-spectra at the region around [O III]λ495.9 + 500.7 nm @ z ∼ 0.8; the Hα λ656.3 nm and [NII]λ658.3,654.8 nm lines @ z ∼ 0.4; or an object with ab isolated emission line (to be analyzed). Sky lines at the ORM, where GTC is sited, and wavelength covered by OTELO survey.